George Hill dropped his second game-winner of the season Tuesday in Los Angeles, sparing the viewing audience five additional minutes of ugly basketball and dropping the Lakers to 7-8. The sub-.500 record has predictably inspired panic around the Lakers, even though they are one of just four teams ranked in the top 10 in both points scored per possession (no. 9) and allowed per possession (no. 4). The other three members of this ever-changing crew — Memphis, San Antonio, and Oklahoma City, the last playing surprisingly good defense that will merit some in-depth attention if the Thunder maintain it as their schedule gets tougher. The Clippers, at no. 11 in defensive efficiency, are basically in the club, and the Knicks, still tied with Miami at no. 1 in offensive efficiency, were heading it up until their defense started slumping a week ago. The dual top-10 rankings mask how inconsistent the Lakers have been against a home-heavy schedule, and we’re still at the point of the season where two massive blowout wins — against Detroit and Dallas — can skew their overall numbers a bit. But this still projects as a solid team, and you sometimes want to scream at Lakers fans that the point guard signed to run the whole damn thing essentially hasn’t played yet. After the game, Frank Vogel suggested David West could have set an actual screen for Hill, but he never came close to doing so, and it doesn’t appear West had any intention of setting a real screen. 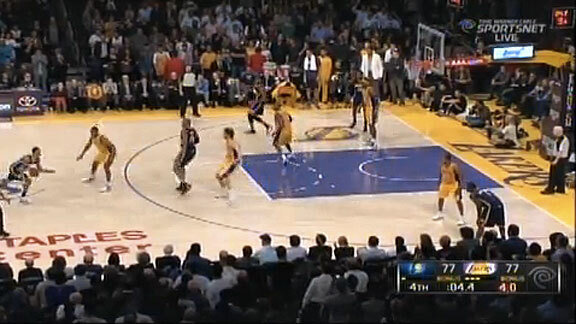 He instead ran hard up toward Hill as if he were going to screen Metta World Peace, only to suddenly veer off toward the top of the 3-point arc and away from Hill. But if the screen never comes, all that open stance does is give Hill (or Paul) a clean lane to the basket — in the direction of his strong hand, no less. Running it with a jump-shooting big in West’s position is essential. West is a threat to 20 feet, which means the defender in Pau Gasol’s position here will sometimes instinctively chase West, fearing West’s jumper and granting Hill an even cleaner path to the hoop. Gasol actually reads the play pretty well, stopping short to stick on Hill while World Peace trails the play and cuts off a potential passing lane to West. The Pacers do not quite get the best-case scenario, but Gasol at his age and size just doesn’t have the quickness to change direction and keep up with Hill. And Dwight Howard’s rotation from the weak side, as has often been the case this season, is just a beat late. That will come. The play probably has a legacy that pre-dates the Roy-Aldridge combination in Portland. The NBA will always be a copycat league.